The hotel is half a mile from Manchester Piccadilly railway station (12 minutes walking distance or 5 minutes taxi ride) and the MEN Arena. Manchester Airport, 9 miles away. Hop on the tram to Old Trafford to watch Manchester United, or catch local City. All bedrooms are climate-controlled and feature a flat-screen TV and complimentary high speed WiFi. In privilege and superior rooms you'll enjoy a Nespresso coffee machine, newspaper, robe and slippers. Treat yourself to a top-floor superior room whe re you'll find an interconnecting lounge with sofa, desk, additional television and city centre views. Four poster rooms are also available. This individually styled restaurant offers a wide selection of internationally inspired dishes. These range from quick snacks to three course meals and are complemented by a range of fine wines from around the world. The Bar offers a range of wines beers, spirits and soft drinks. If making your way to The Brasserie feels like too much effort, light meals are available in the bar allowing you to continue relaxing. Upon arriving at the hotel I had issues with the booking as I had booked with Accord paying extra for a late checkout up to 6pm. The hotel reception at the time did not guarantee my late checkout and as it was the only reason I had booked into Mercure I was frustrated. My whole day was planned around a late checkout including international conferences in the afternoon which I needed a quiet place for. Jane the receptionist noticed my frustration as I started to enquire about nearby hotels... she then started searching the system and kept reassuring me that she would do everything she can to see whether it’s possible to have a late checkout... after several minutes of frustration she managed to secure a room which was required at a later time the next day in order for me to get a late checkout... I’m ever so grateful. They managed to help me keep to my schedule which I had planned with my clients. They were amazing. Thank you. Dear Steve B, Thank you for taking the time to review the Mercure Manchester Piccadilly Hotel. It is great to read that you enjoyed your recent stay with us, and that you were pleasantly surprised with our gesture of the upgraded bedrooms. Thank you for being a loyal Le Club Accor Member. Kind regards, Claire Chapman Guest Relations Manager. I stayed in a beautiful room unfortunately it was too cold and room 618 was positioned in front of the lifts . So people coming home at night and talking and being generally in party mode, it kept me awake . It was such a shame. Breakfast was disorganised, couldn’t find the toaster until I had finished, the bacon was cold, I don’t mean Luke warm ,I mean cold. I went for more coffee, when I came back the waitress had cleared my table and someone else was sat there. Overall I had high expectations for the price but I was very disappointed. Dear Ldnsolo, Thank you for taking the time to review the Mercure Manchester Piccadilly Hotel. It is great to receive your feedback as this is how we are able to improve our products and services. I am truly saddened to read that your stay did not meet expectations. In regards to the room, had this of been reported, the 24-hour Guest Care Management Team would have been more than happy to move your bedroom to somewhere more suitable for you, with less noise from guests using the lifts. The breakfast layout is spread across the front of our Bar and Restaurant area to avoid congestion in the different breakfast areas. Please rest assured I will pass on your comments for the relevant departmental managers to address with their teams. Kind regards, Claire Chapman Guest Relations Manager. Room was great size and clean, curtains were partially hanging off in the corner of the room. Elevators exceptionally slow at busy times and not helped with one being out of order on the Saturday morning. Lot of outside noise. Bed was uncomfortable, room was tired & in need of a re-fresh, the carpet was dirty, one of the towels had a stain on, the rooms aren't soundproof, I had a very noisy neighbour and heard everything from the corridor. overall, not a very pleasant stay. check in was good and quick, room was good apart from as a privilege room the coffee machine was falling apart, not that it made a diference the bath itself floor looked quite old . the breakfast was luke ward to be honest but a good variety was available, little surprised as it was a privilge room did it spoil our stay not really, we were in room 807 nice view compared to other mercure hotels we have stayed in room could be better did it spoil our stay no its just an honest review. We only needed one night as we were going to see a show at the Manchester Arena. The hotel met expectations and was very clean and comfortable. We didn’t order breakfast but enjoyed a checkout at 12 pm which gives you a bit of a lie in. 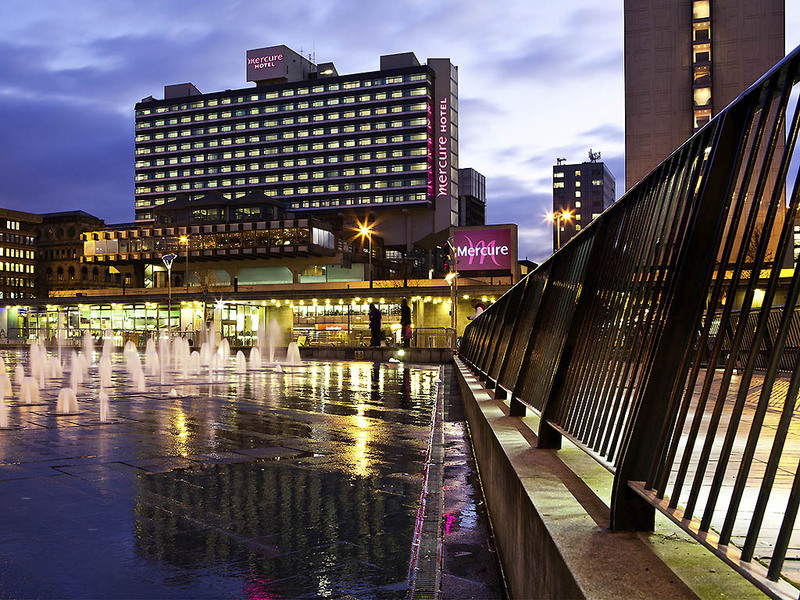 I would definitely stay at this hotel again as it is in a nice area of Piccadilly Gardens. Only stayed for two nights but was most satisfactory. Our room maid Frieda looked after us and I cannot speal too highly of Paul the concierge who was very helpful. I stayed two weekends in a row. The first was for two nights - on that occasion I asked for a lower level room by telephone in advance and was still given level 7. The room was grubby, the breakfast was cold and running out of some items and worst of all, my room was not locked after cleaning and was left open all day. I informed the desk but had no apology from management or offer of an upgrade next time. The second occasion, for one night, I had level 6. One of the lifts was not working and after waiting nearly ten minutes to get in one, I had to walk down a back staircase (I think the staff stairs, as couldn't find directions to the main one) carrying my suitcase. Again, the breakfast was cold, although we were there at the start of service. Pleasant check in experience, very comfortable room and good variety of food for breakfast. Very nice hotel. Comfortable room. However, there was a lot of noise around 1am. It sounded like a woman screaming and I know it wasn't the hotels fault but it did interrupt my sleep. The room was also quite cold at times and the heater was unresponsive. Average room, breakfast which gave me food poisoning and left me in pain for three hours until (eventually) the Gaviscon took effect. Unfortunate that I had to pay over the odds for the remedy in your in-house shop. I am aware that other breakfast guests did not suffer the same malaise, so I imagine it was a random unfortunate lapse in kitchen hygeine (I ate eggs.) Nevertheless, it caused me considerable distress and I believe there is a hygeine issue you need to address. Rather than recommending your hotel, I will be warning friends and family away from staying with you.